Do your employees need access to data while outside the office? Provide them with the right apps, accessible on their mobile devices, and they can access all the data they need, whenever they need it. Enterprise mobility is about enabling every employee to access any piece of information they need wherever they are through file sharing and services accessible by mobile. The hardest part for any business is figuring out which enterprise mobility services and strategies are most important for their business and how to put them in place. New Media Guru will assess your existing services and infrastructure and suggest the best way for you to support your workers. We’ll then help you every step of the way to bring that service to fruition. Ask the tough questions of your business to help you develop a mobile strategy. Create a design for the theme of your application, helping you to visualize how it’ll look on your mobile devices. Our design team will work with you to finalize the theme and apply it to your application. We run testing across multiple devices and multiple platforms. We’ll ensure that your apps receive regular updates, as well as maintenance and support. We’re here for you post-launch and ready to help you with your next idea. 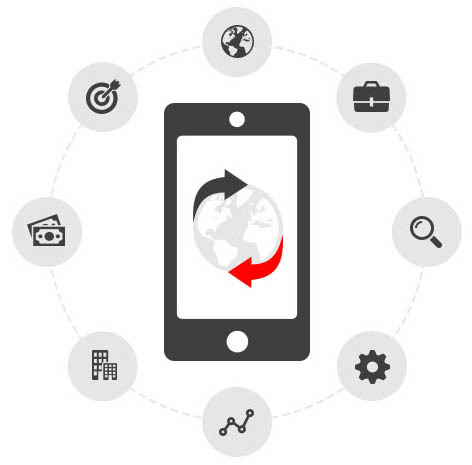 Our expertise enables us to provide you with apps that are compatible across multiple devices and platforms; solutions that will considerably improve your ability to grow your business. Do you need an enterprise-level mobile app? Speak to our team today to discuss how we can help.